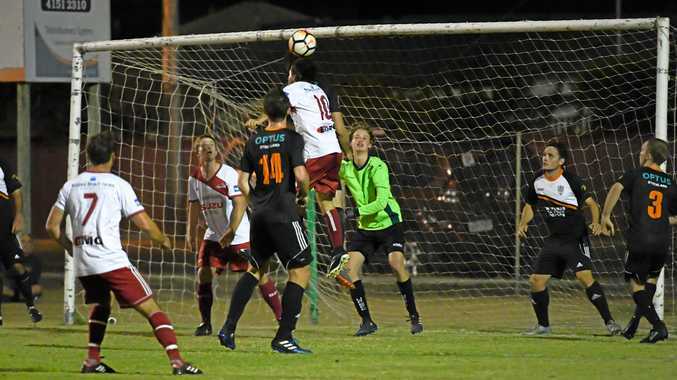 FOOTBALL: The Wide Bay Premier League minor premiership could be heading to Bingera this weekend. The Stripeys are one point away from the title and a home final after beating Sunbury 4-2 at Martens Oval on Saturday. The ladder leaders extended the margin at the top to eight points with a strong second half that saw the side score three goals after the score was level at 1-1. But Bingera coach Brett Kitching wasn't entirely happy. "It wasn't our best performance,” he said. "Going forward let us down. We had four one-on-one chances with the keeper that we didn't take. Bingera now faces second-placed Doon Villa this week in what could be a preview to the first week of the finals. Kitching said the side would have to play a lot better than Saturday to get a result. "John Wheeler was our best but everyone else was around par against Sunbury,” he said. The win for Bingera was the first of four for the Rum City with Bargara, The Waves and Brothers Aston Villa also winning. Bargara remained two points ahead of The Waves in the battle for fourth, the last finals spot, with a 4-2 win over the United Park Eagles. The Reds scored three second half goals after the score was 1-1 at half time. The Waves maintained the pressure on Bargara with a 4-0 win over the United Warriors and Villa put nine past the KSS Jets in a 9-1 win. The four wins by Bundaberg was the second time it has happened this season. It also occurred in round seven.